The historic hospital building at Amsterdam Avenue and 114th Street was designed by prominent socialite architect Ernest Flagg. The chapel of that hospital has stained glass and is the work of the same architect. Roxy Hotel (formerly The Tribeca Grand Hotel) post clock. in front of the Tribeca Grand Hotel. Photo: Tom Bernardin, May 5, 2000. Gives time but not temperature. Photo: Tom Bernardin, Spring 1999. Less traditional is the McGraw Hill Sun Triangle in the sunken plaza in front of the McGraw-Hill Building. This very interesting fifty-foot high stainless steel sculpture denotes the passage of seasonal time by showing the relation between the sun and earth at the solstices. The three sides of the metal triangle point to the three seasonal position of the sun at solar noon in New York. The shortest side at the bottom points to the sun’s lowest position on the winter solstice around December 21. The longest side points to the sun’s position on the spring and fall equinox at noon around March 21 and September 23. The diagonal side points to the sun’s highest position on the summer solstice at noon around June 21. Perhaps, the most impressive feature of the triangle’s designs is that it casts during certain some parts of the year both a regular shadow as well as an “anti-shadow” resembling two hands of a clock on the plaza below. Next to the triangle is a depiction of the solar system engraved in the ground. Clockwork Mechanism, west end clock tower. Photo 1: Tom Bernardin, Summer 2000. Photo: Tom Bernardin, Summer 2000. 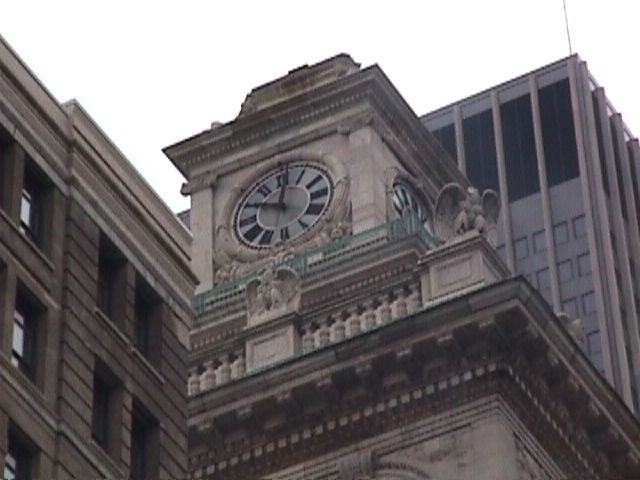 In 1847 the Church paid local clockmaker James Rodgers a sum of $1,600.00, plus additional costs for the clock in the tower “required to be of the best materials and workmanship and warranted to keep accurate time.” It was assembled at his facility at 410 Broadway, a few blocks north of Trinity Church. At the time of construction the clock was the second largest clock in the world and weighed nearly four tons. One commentator noted that by building such a big clock, Mr. Rodgers “seems to have made an effort to see how much metal could be put into it.” The clockwork mechanism was placed forty feet above the dials and bells out of fear that the bell ringers might get caught in the powerful gears, something not unheard of in Europe. Thus, the movements of the hands were worked by tin shafts encased in long thin oak casings that ran from the mechanism to the dial. The church members who hired Mr. Rodgers must have been pleased because keeping good time is what exactly the clock did. According to a Times article written in 1902, over fifty years after the clock was installed, it was reported that the “clock’s only claim to prominence is its immense size and its excellent timekeeping qualities. It is the largest in the city and one of the heaviest and best timekeepers in America.” The article goes on to note that “but for a slight interruption for occasional repairs [the clock] has been running ever since. Its interior is all on a larger and clumsy scale and the wheels, pinions, and cranks take up nearly the whole inside space of the large tower, and the friction is so great that constant oiling and care have been necessary all along to keep the clock in good working order.” Another article that described the clock’s weights and pendulum noted that, although the three dials of the clock were 8-feet in diameter [actually 10-feet], “there [was] enough power . . . to carry four 20 foot dials. Thanks to the heavy [18 feet long] pendulum, it does keep very fair time.” The clock was not only the country’s biggest but also was built with the second biggest dial in world at the time. It took over an hour for two men to make about eight hundred and fifty turns to wind the seven hundred feet long, three inch thick rope that hoisted the 800, 1200, and 1500 pounds weights that powered the mechanism. The largest weight had a drop of fifty-feet, and if not for the bales of hay placed below it, serious damage to the foundation of the church would have resulted when the rope broke about a quarter century after the clock was installed. A local watch repairman by the name of Henry Fick was one of the men charged with the job of winding and servicing the clock for a better part of the nineteenth century. He was also contacted in the wee hours of the morning for an emergency repair on the first Christmas of the twentieth century when the clock stopped just a few minutes after midnight. To the people who lived in the neighborhood, the stopping of the clock was considered ominous, even taken as a sign that someone in the congregation would die within the week – no one actually died – a prevalent superstition of the time whenever a community clock stopped. Fick was able to get the mechanisms working again, but over the next few years more problems ensued. In 1905, to the dismay of many, it became that the hands of time were winding down for the much loved clock, and it was replaced with current the #3 E. Howard clock guaranteed by the company to “tick regularly for 200 years.” The job of winding the new clock was far less demanding, and according to Owen Burdick that duty was handed over to his predecessors. 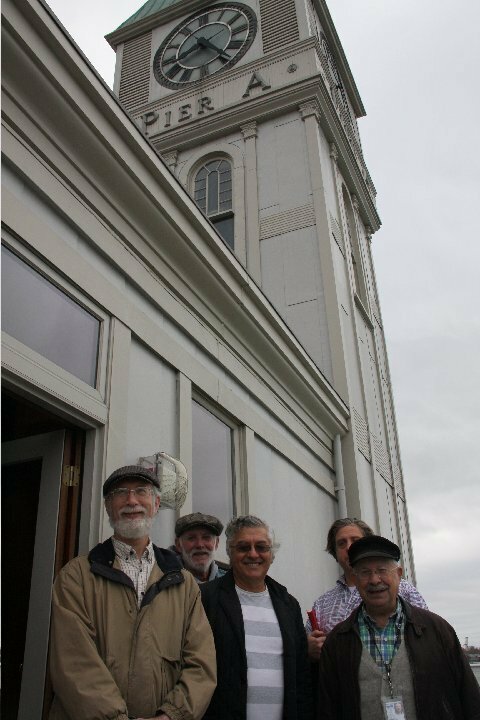 The Elderhorst Bells Company eventually electrified both the clock movements and the bells, which still chime on the hour, the half hour, and the quarter hour as they have been doing for over a century and a half. 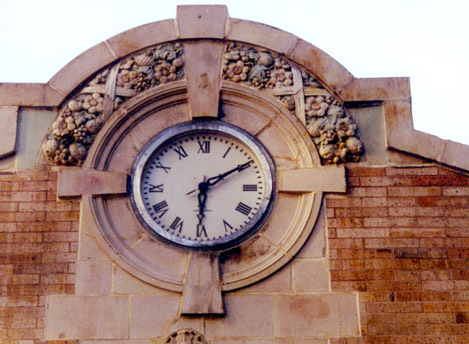 As an interesting side note, in 1929, hundreds of pigeons were removed from the clock tower where they had found a warm resting place, but occasionally they got caught up in the gears of the clock. The tower windows, as in most clock towers today, have since been screened to keep such intruders out. One hundred years after being installed the clock is still running on time. 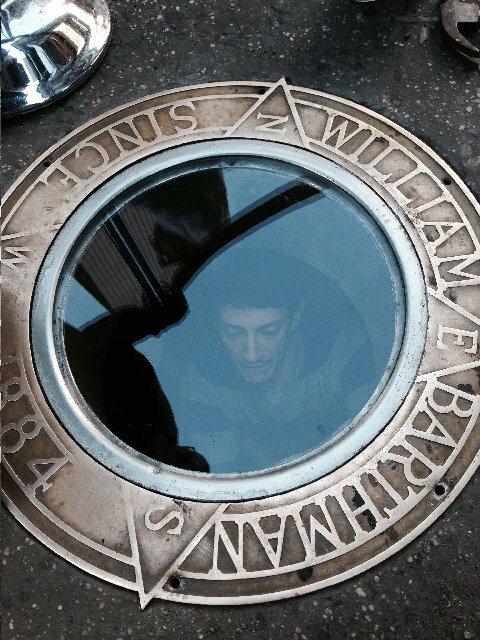 Barthman, located in the sidewalk on the corner of Broadway and Maiden Lane. 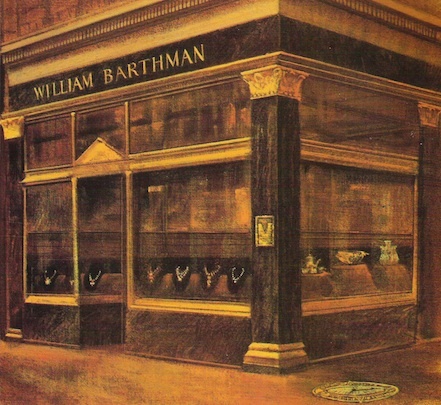 Aside from the fact that it was specially made for the William Barthman Jewelers, established in 1884, not much else is known for sure about it. It is believed that the Self-Winding Clock Company installed the clock around the turn of the twentieth century, but it dates as far back as 1899 in some accounts. Since installation, it has received several facelifts, including a very durable cover made by NASA from the same glass used on the space shuttle that protects the clock’s face from the continuous foot traffic. Saint Paul's Chapel. 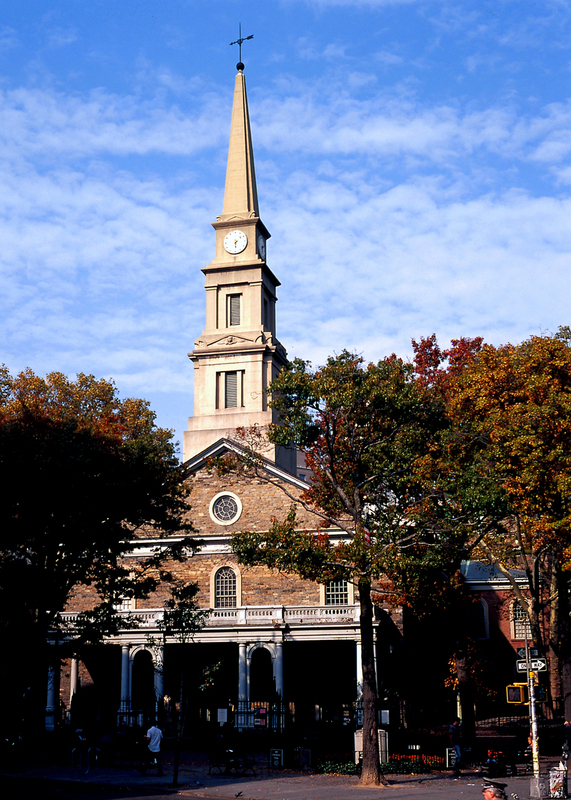 The oldest clock in New York City is found on the steeple of St. Paul's Chapel. Photo: Wayne Beugg, June 2001. Metlife Building. The incredible three-story Self winding clock on the Metlife tower, ornamented with astonishing detailed marble and mosaic tile work, is perhaps the city's most impressive timepiece. It overlooks Madison Square Park. 346 Broadway is a New York City landmark with a landmarked clock mechanism. 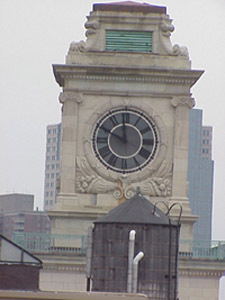 The clock was manufactured and installed by the E. Howard Clock Company of Boston, New York and Chicago for the New York Life Insurance Company in 1897. Prior to 1980 the clock had not worked for at least twenty years and had not been lighted for night-time viewing for over thirty years. The clock is powered purely by a weight that can be raised either manually by usage of a large key or by a 3/4 horsepower electric motor. In the southeast corner cabinet is located a 1,000-pound weight which powers the time keeping part of the clock off which the four dials run. In the double-width cabinet on the northwest side are located two 800-pound weights which provide power to activate a 70-pound hammer which strikes on the hour. The hammer and the bell which it strikes are located in a chamber above the clockwork. This chamber has louvers on all four sides which allow the sound to go out while minimizing the entry of rain and snow. The bell, weighing 5,000 pounds, is twice the size of the Liberty Bell. It was cast for the Howard company by the McShane Foundry of Baltimore in 1897. On the hour one can observe how a lever, attached to the works, pulls on a cable which activates the hammer in the room above. The Howard Company, in a letter dated October 25, 1895, described the clock as a "No. 4 Striking Tower clock made extra large and heavy in all the parts where strength and size are required of HARD HAMMERED COMPOSITION, arbors and pinions of best OPEN HEARTH STEEL, frame and supports of CAST IRON, disconnecting device for the dial works arranged so that the clock can be readily set from inside the tower, cluster gear for...dial works properly arranged so that the clock can be used...on the Broadway end of the building, movement with Gravity Escapement, compensating two seconds pendulum...and a twelve foot sectional dial with hands, shafting, shafting and all material that will be required to set up the clock...". The Howard Clock Company, still in business, discontinued manufacturing and servicing of tower clocks in 1964. They did, however, provide a replacement pilot-face and small gear located on the works. 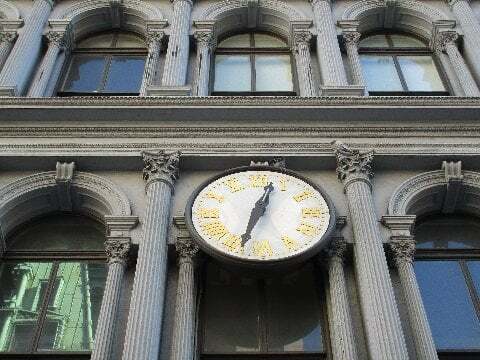 This clock is unusual, especially in New York City, in that it is completely original. 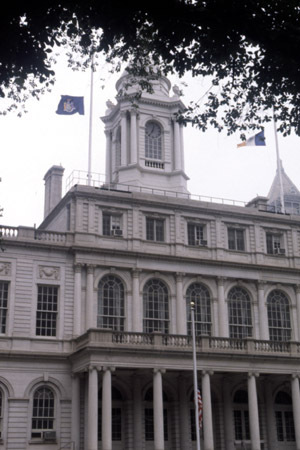 Many clocks, including the New York City Hall clock and the Jefferson Market Courthouse clock, have been electrified. 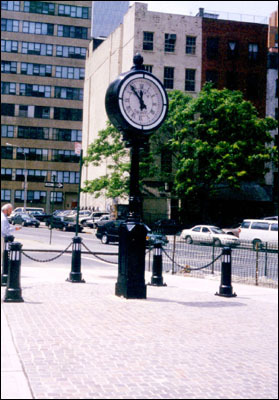 The 346 Broadway clock, in its original state, still lives up to the Howard Company's guarantee to run accurate to within ten seconds a month. 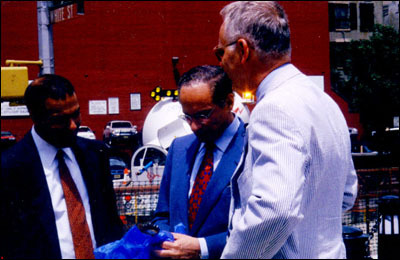 Photo: Art Koch, February 2001, Jim McIntosh, February 2001. The E.V. Haughwout Building is a five-story, 79-foot tall, commercial loft building in the SoHo neighborhood of Manhattan, New York City, at the corner of Broome Street and Broadway. Newly restored clock awaits installation by Ken Neill of The Verdin Company. The clock on top of the Paramount Theatre was not only the highest point in Times Square, but once the highest point in all Manhattan north of the Woolworth Building in lower Manhattan. Today, the large clock face and globe are still one of the area's nicer sights despite the many new buildings. It is a working illuminated tower clock with 5-pointed stars in place of numerals. The entranceway of the Paramount also retains this stylish clock above the door. Photos: Susie Bernardin, Spring 2000. Entranceway photo by Vinit Parmar. 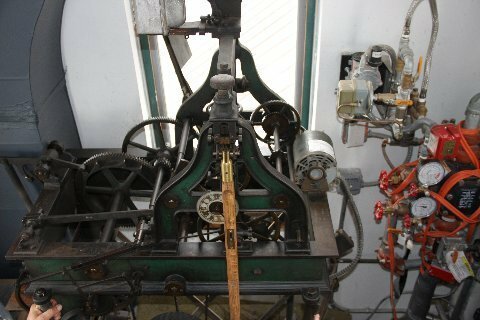 Clock maker, John Stokell installed the first timepiece in Saint Mark’s Church in 1828. In 1828, the church steeple, the design of which is attributed to Martin Euclid Thompson and Ithiel Town, in Greek Revival style, was erected. More changes came about beginning in 1835, when John C. Tucker's stone Parish Hall was constructed, and the next year (1836) the church itself was renovated, with the original square pillars being replaced with thinner ones in Egyptian Revival style. In addition, the current cast- and wrought iron fence was added in 1838; these renovations are credited to Thompson. At around the same time, the two-story fieldstone Sunday School was completed, and the church established the Parish Infant School for poor children. Later, in 1861, the church commissioned a brick addition to the Parish Hall, which was designed and supervised by architect James Renwick, Jr., and the St. Mark's Hospital Association was organized by members of the congregation. Outside the church, the cast iron portico, was added around 1858; its design is attributed to James Bogardus, who was an early innovator in cast iron construction. At the start of the 20th century, leading architect Ernest Flagg designed the rectory. Once part of a larger factory complex built by a cigar rolling company, the recently refurbished Timekeeper Building is the only former factory in Manhattan to retain a clock. E. Howard clock mechanism on display. Taken down around 1979. Where is this clock? Photo: Becket Logan, November 1973. Constructed in 1851, the building predates Central Park in which it is currently located. Designed to resemble a medieval castle with eight battlements, it originally housed munitions for the New York State National Guard. In 1853, the State seized the land the building sits on and granted it to the city to build Central Park. One year later, the city purchased the Arsenal for $275,000, removed all the arms, and established park administrative functions on the premises. The building subsequently became home to the 11th Police Precinct and afterwards the American Museum of Natural History before the museum moved to the other side of the park. By the turn of the century, the building was deteriorating, but it was saved by a $75,000 face-lift in 1922, which included a new central turret with a clock installed by the E. Howard Co. Today the Arsenal houses the New York Parks and Recreation Department, the Central Park Administrator, the City Parks Foundation, the Historic House Trust, the New York Wildlife Conservation Society, the Parks Library, and the Arsenal Gallery. 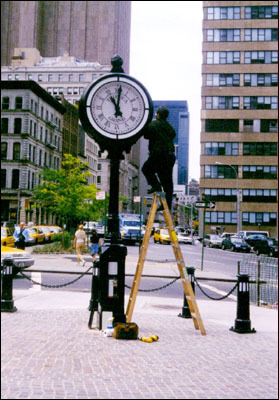 The most playful of all the city’s timepieces is the Delacorte Clock situated near the entrance to the Central Park Zoo. On its top are two bronze monkeys that strike a bell on every half-hour, while six bronze animal figurines march in a circle at the base to one of thirty-two nursery rhymes. The scene is set in motion from a signal transmitted from a computer in a nearby building. The dancing animals include a goat playing the pipes of Pan, a hippopotamus playing a violin, a penguin playing a drum, a kangaroo playing a horn, an elephant playing a keyless accordion, and a bear playing a tambourine. The clock was erected in 1965 as gift from publisher and philanthropist, George T. Delacorte, who wanted to build a glockenspiel comparable to those found in Europe. Photos: Tom Bernardin, Spring 1999; Chris Desantis. The Waldo Hutchins Bench is the most notable of all the benches in the park because of its unique time keeping qualities. The large marble bench, a gift from August S. Hutchins, measures four-feet high by twenty-seven feet long, and has a very interesting bronze timepiece in the form of a tiny woman on the top of its middle portion. Semicircular lines inscribed in the slate at the front of the bench mark shadows cast off the sculpture at 10:00 am, high noon, and 2:00 pm during the vernal and autumnal equinoxes. A shadow is also cast in the hemicycle, which is the curved metal recede carved into the top of the bench that is configured with lines to indicate the hours. Etched into the back of the bench are the words “Alteri Vivas” “Oportet Si Vis Tibi Vivere” and “Ne Diruat Fuga Tempor Um,” meaning “You should live for another if you would live for yourself” and “Let it not be destroyed by the passage of time.” Designed by architect Eric Gugler, the bench was mounted in the park in 1932. The carved white marble stonework is believed to have been sculpted by Corrado Novani and the Piccirilli Brothers Studio, and the sundial was designed by Albert Stewart, although the tiny bronze woman at its center is attributed to Paul Manship. Click Here for Central Park Website. Sundial enhances the Shakespeare Gardens on the west side of Central Park at the base of Belvedere Castle. The gnomon on the four-foot tall, stone sundial faces north, a principal discovered by the Greeks that allows for precise time-tracking. Harlem Justice Center. A brick and brownstone Romanesque Revival Building, built in 1893, to serve as the Municipal and Magistrate's courts.